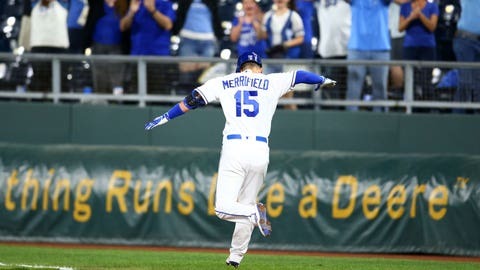 Whit Merrifield is safe on a drag bunt that drove in a run and gave him a hit in his 31st consecutive game, a new Royals record. KANSAS CITY, Mo. — Even baseball’s hottest hitter can’t keep pace with the Seattle Mariners right now. Gore was part of the Royals’ back-to-back AL championships in 2014 and 2015, but usually as a pinch-runner. He has appeared in 67 games but had only 20 plate appearances. He got his first major league hit last season with the Chicago Cubs. He got his first hit with the Royals on Monday. Mariners RHP Mike Leake (2-0, 2.92 ERA) will get the start for the Mariners in the final game of the four-game series. He’ll face Royals RHP Jorge López (0-1, 4.09 ERA).